“Who Can Kill a Child?” opens with a seven minute montage of graphic war footage as the narrator discusses the toll each war took upon the children caught in the middle. Such a sobering opening immediately demonstrates that this movie has aspirations above the average killer kid movie. It also adds a political edge that I didn’t expect, but considering this was being made as the Vietnam War was effectively coming to a close; it makes a certain amount of sense. It also perfectly sets things in motion with an undertone of dread. We are introduced to Tom (Lewis Fiander) and Evelyn (Prunella Ransome), an expectant couple from England who are on vacation in Spain. The city they are visiting is swarming with people and loud raucous celebrations complete with parades that have cool dragon costumes and some rather insane fireworks displays. Amongst all the mayhem and crowds, a few bodies come washing up on the beach but Tom and Evelyn are much too caught up in things to notice. Tom is eager to go to a small island by the name of Almanzora, which he claims to have once visited in his younger days. Evelyn is eager to get away from the crowds, so they rent a boat and head out. Four hours later they arrive at the island to see children running loose with no adults to be found anywhere. “Who Can Kill a Child?” is the slowest of slow burns. The sense of dread is palpable from the moment the story starts and it begins at a creeping pace to build and build as Tom and Evelyn wander about the island, discovering more and more that something has gone horribly wrong. As the viewer, we know what’s happened and we are left helpless to watch as the couple fall deeper and deeper into a trap. There isn’t much violence in the movie, but when it does happen it is brutal and quick. Despite being made nearly forty years ago, it still has the power to shock. There are no ready explanations given for what’s happening to the children, allowing the viewer to draw their own conclusions. The whole could be read as a straight up supernatural horror story or more of a metaphorical cautionary anti-war film. 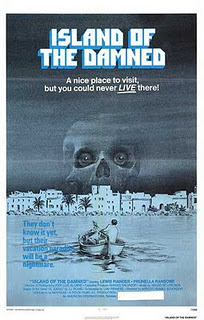 The film looks very good; horror and menace are played out in bright sunny locations, giving them a strange edge. Fiander and Ransome’s performances are naturalistic, even if they do come across as just a little slow on the uptake. The children thankfully act like children rather than giggling maniacs or soulless automatons. They go about their dirty work, like it was any other kind of play. This is no way a party film and probably wouldn’t work too well as a double feature with “Children of the Corn (1984)” or The Children (1980)” but it comes highly recommended as an example that horror can occasionally make serious political and social statements as well as entertain by daring to cross boundaries that shock and horrify the viewer.